12/06/2018 02/15/2019 - by Liam Weisman - 4 Comments. A few years ago, the one real choice gamers had when it came to gaming was an Intel chipped desktop computer. But that changed when AMD came into the light with their lineup of CPUs and later GPUs. Now the red team is easier to recommend than it ever was after making a good name for itself and winning a few awards. With over 600 awards won, AMD decided to further their victory and performance punch to Dell. Dell invited AMD to help renovate the Dell Inspiron 5675 and Dell Inspiron 5676 gaming desktops with their second generation Ryzen CPUs and GPU. For the most part, it was a move that would spell doom for PC builders as the Dell Inspiron Gaming Desktops would be better priced than buying individual components and assembling them. 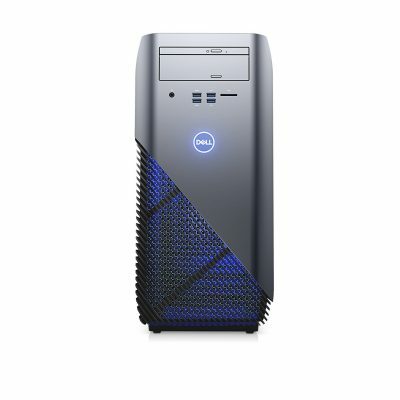 The Dell Inspiron 5675, has options in its configuration for processors between Ryzen 3 1200, Ryzen 5 1400, and Ryzen 7 1700X. The topmost premium model trades out AMD for an Intel GTX 1060 graphics card. As far as graphics go, the Dell Inspiron 5675 has options for RX 570 and RX 580. Our reviewed unit is the Dell Inspiron i5675-A933BLU-PUS desktop which sports a Ryzen 5 1400 processor and AMD Ryzen RX 570 GPU. It also packs 8GB of DDR4 memory but you can max the memory upgrade to 32GB, which in all sense of the word, we consider overkill (this is how much RAM you need). Let’s see how these blend of components performs. Like other Dell Inspiron desktops, the Dell Inspiron i5675-A933BLU-PUS has an upgradable design with cleaner and more attractive edges. The system is fitted with among the best components including the most recent AMD Ryzen 5 processor and AMD RX 570 graphics card (4GB DDR5). The Dell Inspiron 5675 design is a remarkable balance of gamer aesthetic and business-minded PC. As if to give would-be buyers a taste of the Alienware gamer side, the Dell Inspiron i5675-A933BLU-PUS’s side panel and partial front body is shrouded in vents with a blue RGB light sipping through them. It’s a subtle but futuristic sleek design with the dark silver finish that takes cues from a business PC. The bottom half meshed section of the case makes the PC airy, allowing plenty of airflow which allows the system to run quietly. The Dell Inspiron i5675-A933BLU-PUS is a great alternative for users who can’t build their own PCs from scratch. It mixes up a bit of gaming flair with professional aesthetics that Dell is well known for in the Dell XPS desktops. The case is not flashy as those gamer-centric PCs with out-of-the-world gaming themes (looking at you Asus G11DF). But it spices up well with blue LED lighting and a myriad of vents on its bottom half. The New Dell Inspiron 5680 builds on this design with additional tweaks here and there. At 17.23 x 8.5 x 18.07 inches and weighing in at 26.43 pounds the Dell Inspiron i5675-A933BLU-PUS fits the bill as a gaming tower. However, in comparison with some other gaming PCs in its range, it is slightly smaller. For instance, the CYBERPOWERPC Gamer Xtreme VR GXiVR8060A5 Gaming PC (18.46 x 7.87 x 17.89 inches) and CYBERPOWERPC Gamer Xtreme GXIVR8020A5 Desktop Gaming PC (18.5 x 7.9 x 17.9 inches) are a good example of desktops that compare relatively well to our unit. The main difference between the Inspiron 5680 and 5675 two models, if you asked, is that the 5680 is more customizable. It offers a bit more edge, which should be good news to users looking to upgrade. One can opt for a tempered glass side panel with the Dell Inspiron 5680 just as is with OEMs like CyberPowerPC, SkyTech, and iBuyPower. One last thing we appreciated is the fact that the side panels of our reviewed model get off easy. Should you need to have a peek into the gut, all you need to have is a Phillips head screwdriver. The inside is neat and well organized too, save for the cabling where we noticed a bit of overlapping. On the bright side, the inside has plenty of room for expansion, an appealing aspect for DIY-ers looking to tweak and upgrade. Generally, the easy to remove the side panel and innards give off a welcome sense of scalability. One of the strong features of the Dell Inspiron 5675 is its port system. There are plenty of ports both at the front and rear of the PC with the highlight being USB Type-C. A bulk of the ports are USB 3.0 ports which means a number of high-speed devices can be simultaneously connected. The front section houses two of those USB 3.0 ports, two USB 2.0s, a single USB type-C port, a microphone headphone combo jack and micro SD slot with high-speed SD card speed. At the rear is another healthy set of ports including two HDMI ports, and two Display ports both provided by the graphics card. The system offers six additional USB 3.0 ports, an Ethernet port, two USB 2.0 ports, and 5 audio input/output jacks. Stacked with an AMD Ryzen 5 1400 processor, the Dell Inspiron 5675 is a wolf in sheep’s clothing. The processor works with an 8GB DDR4 memory which is enough to get by most modern games and daily computing tasks. But we’ll get back to memory a bit later on. The AMD Ryzen 5 1400 is the most affordable processor in the Ryzen 5 processor lineup. And as such has the lowest performance of the bunch. But that’s not to say it’s no performer. By most standards, it compares well with Intel’s i5-7400 processor but surges ahead thanks to overclocking capability. At stock, it runs at 3.2GHz and one turbo boost achieves up to 3.7GHz. Aside from being handsome and having a powerful processor, the Dell Inspiron i5675 sports an 8GB DDR4 memory. Other configurations offer as little as 4GB DDR4 RAM so our unit was much better and less crippled on that front. As far as storage goes, the Dell Inspiron 5675 comes with 1TB hard drive storage as its primary drive. Gaming performance for the Dell Inspiron is far too short of beastly compared to the likes of the Acer Predator or Alienware. However, the AMD RX 570 graphics card makes a compelling case of its own. While the RX 570 card is a good replacement for its predecessor RX 470X, it is basically a refresh of the old card but with a better value proposition. As a result, it offers betters speeds but takes up more power compared to its predecessor. You don’t need to worry about huge electricity bills, no. AMD claims the new power state reduces energy demands when the GPU is on idle, that way reducing temperatures and power consumption by a marginal but significant difference. Without needlessly being too technical, all that means it just handles itself better than its predecessor. And does that with flair; running quietly and keeping cool even when overclocked. On the gaming front, it handles 1080p gameplay superbly. Running it through its paces on some recent titles suggests that its a master at Full HD gameplay and runs best at high/ultra settings for a couple of games. The star of the show for the gaming scene is the AMD Radeon RX 570 4GB GDDR5 Graphics card. Since Dell Inspiron i5675-A933BLU-PUS falls in the same price range with rivals such the CyberPowerPc Gamer Xtreme GXIVR020A5 and SkyTech ArchAngel GTX 1050Ti, we’ll constantly refer to them. But first a bit of intro to this card. The AMD Radeon RX 570 is a refresh and upgrade of the RX 470 and it’s designed for Full HD gaming on high settings. As such, games on the Dell Inspiron are well playable at Full HD with majority averaging 60 fps. Compared to Intel, the AMD Radeon RX 570 falls in between Nvidia GTX 1060 (3GB memory) and the Nvidia GTX 1050Ti. All these card qualify as high power consumption graphic cards. As the name suggests, the SkyTech ArchAngel GTX 1050Ti spots a Nvidia 1050Ti card while the CyberPowerPC trods ahead with the slightly powerful RX 580 card. On gaming runs, the RX 570 showed impressive results on Full HD. We played a couple of games including Hitman which tends to favor AMD cards. On Hitman, it scored 79.5 fps which is 2 fps ahead of the AMD RX 470. On the same tests, Nvidia’s GTX 1060 scored 80 fps which is way remarkable than the green team’s. The competitive Tomb Raider played on high preset Full HD managed 68 fps on the RX 570. Meanwhile, GTX 1060 surged ahead with beyond 81 fps. In conclusion, all this means that the AMD RX 570 is a strong card for gaming. But the GTX 1060 is relatively better. Nvidia proves to be ahead with the 1050Ti and the GTX 1060 card especially on gaming and efficiency. However, the Radeon RX 570 is a real brute on pricing. Here’s a sample video of how the GPU and CPU perform together. Credit goes to Testing games for the video. For users in the market for a no-nonsense PC that can muscle through the hard tasks, and one with a great build to address upgradability, the Dell Inspiron i5675-A933BLU is a solid choice. Aside from a beautifully crafted design that caters for gamers and business profiles, it comes with a few other powerful components. You get an AMD Ryzen 5 1400 processor with the grunt to handle most daily computing tasks, 8GB DDR4 memory. 8GB memory is sufficient for most multitasking tasks, office productivity, web browsing, media streaming, a bit of light photo editing and ultimately some gaming. In a nutshell, the easy to remove the side panel and neatly trimmed bring a welcomed sense of upgradability which is good for any serious gamer. Taken seriously, the Dell Inspiron 5675 has all the potential of becoming a powerful gaming ally over the long-term. It comes easily recommendable as an entry-level gaming PC and is worth your consideration. Since Dell started with the Inspiron series they have been producing hit after hit. The Dell Inspiron i5675-A933BLU-PUS doesn’t fall far from the tree either. Just like the rest of the Inspiron series, the Dell Inspiron i5675-A933BLU-PUS is an aesthetic beauty. It’s a powerful system offering more torque than its name suggests thanks to a combination of high-end components. You get a Ryzen 5 1400 Processor, 8GB DDR4-2400MHz memory, 1TB storage, and an AMD Radeon RX 570 4GB GDDR5 Graphics. Also, the system comes with a quiet thermal design, upgradable chassis all packed in a meticulously designed case. Our unit was a lower configuration but it certainly provides value for money. We easily recommend it as our Editor’s Choice for entry-level gaming. It should please shoppers looking for a quick plug and play PC. Let us know your thoughts about the Dell Inspiron 5675 gaming PC on the comments below. We would love to hear from you.